To get off to a good start in drumming and have fun from the very beginning! To get acquainted with all of the drumming techniques! To get the knack of handling rhythm and rhythmic figures with the drums! Take some time to find out everything about drum breaks, fills and solos! To approach the drums via different musical styles! How2Play offers you the opportunity to download hundreds of drum exercises, grooves and patterns - all combined into courses, each with a specific theme. 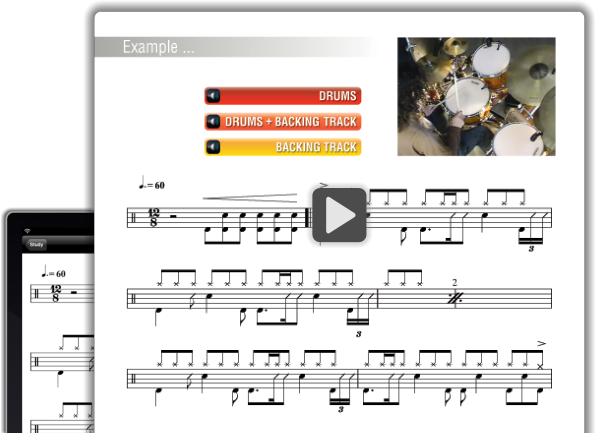 In order to facilitate your training, all the components of a course (drum scores, audios, videos, backing tracks) are integrated into the same multimedia PDF document. Thus, with a single click, you can start the video, audio recording or backing track while also keeping an eye on the score. Following the principle “less words, more music”, How2Play drum courses adhere to the idea of learning and progressing by playing and having fun. For this reason, music and purely musical examples form the major part in all courses, even in those which are rather technical and/or theoretical. Furthermore, every musical application – be it drum groove or pattern – has its own backing track. In this way ideal conditions are created for playing the proposed example, but also personal versions contextually appropriately. The possibilities of using them are endless!